Hanoi (VNA) – The UN Development Programme and the Government Inspectorate of Vietnam jointly held a consultation workshop in Hanoi on March 28 on a report on the use of a new tool - the Provincial Anti-Corruption Assessment (PACA) index to assess anti- corruption work in provincial state agencies in Vietnam. The event aimed to evaluate the report and make recommendations on how to improve the accuracy and trustworthiness of the PACA index in the time ahead. Deputy Inspector General Tran Ngoc Liem said that over the past few years, corruption prevention has been a key task of the Party and State. As such, many policies and measures have been carried out effectively in the field, including those designed to enhance the efficiency of state management over anti-corruption work. This is the third year the Government Inspectorate has conducted the assessment of anti-corruption work at the provincial level. 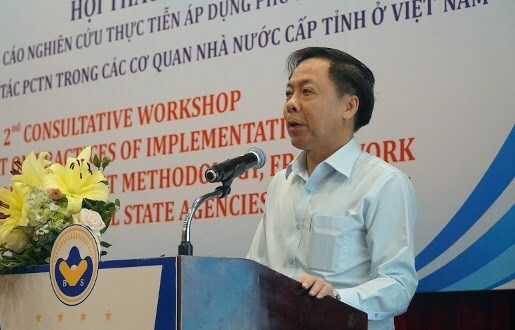 Deputy head of the Government Inspectorate’s Bureau for Corruption Prevention and Control Phi Ngoc Tuyen stated that the content of the PACA criteria are unclear and unspecific. The Government Inspectorate’s working group will continue listening to ideas from localities and units so as to narrow the gap between the assessment criteria of the working group and localities, Tuyen affirmed. According to the report, the average national PACA index based on assessment by localities was 71.68 while the average index calculated by the Government Inspectorate was 58.37 in 2016. Meanwhile, the figures in 2017 were 67.33 and 60.67 in 217, respectively. Participants said that using the PACA is a correct step towards building a stable, developing, and corruption-free society. However, the PACA system piloted by the Government Inspectorate was rather complicated, requiring large volume of documents and human resources. In addition, it was conducted by provincial agencies which are also state management agencies in the localities, without independent supervision of third parties, so the assessment lacks objectivity. They suggested engaging more organisations and groups in the society in conducting the PACA index to ensure the objectivity of the assessment.